Judy Camuso was nominated to serve as Commissioner of the Department of Inland Fisheries and Wildlife by Governor Janet T. Mills and is the first woman to lead the department, overseeing the preservation, protection and enhancement of the inland fisheries and wildlife resources of the state. Judy was the Director of the Wildlife Division for MDIFW since 2013 and has been with the Department since 2007. 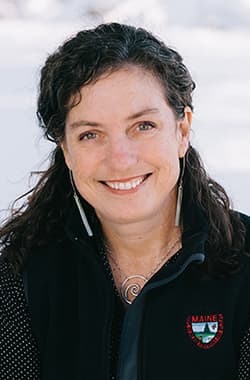 As Director, she oversaw the development and implementation of policy decisions, legislative proposals and rules related to the wildlife division, coordinated a budget of $12 million to manage Maine's wildlife, and was the Department's voice on all matters regarding Maine's wildlife. Camuso has over 20 years' experience with MDIFW and Maine Audubon, and has lead several statewide natural resource initiatives as wildlife director for MDIFW. She began her career in the department as an assistant regional wildlife biologist in southern Maine, then advanced to the Special projects coordinator for the Department, before being promoted to Wildlife Division Director. During her tenure as director she directed the defeat of a statewide ban on bear hunting methods; she created and executed a statewide department communications campaign that has gained national attention; and crafted policy and oversaw the wildlife division. Her work at the department and her prior eleven years at Maine Audubon has earned her the respect of diverse groups and audiences. In 2018, Camuso was named one of Maine Magazine's 50 Mainer's of Maine and, in 2015, she received MDIFW's Employee of the Year, Governor's Award. She is a licensed bird bander and an avid birder, as well as a hunter, who canoes, hikes and bikes. MDIFW is charged with the protection and management of fish, non-game wildlife, and habitats, as well as restoration of endangered species like the bald eagle. In addition to its conservation duties, MDIFW is responsible for enabling and promoting the safe enjoyment of Maine's outdoors — from whitewater rafting to boating, snowmobiling, hunting, fishing, and wildlife observation. The agency's constituents include the fish, wildlife, and people who call Maine home, as well as visiting outdoor enthusiasts and ecotourists who visit Maine and contribute hundreds of millions of dollars each year to the state's economy.